unintentionally matches her home’s décor. (along with a lot of brutal editing). I hope to give you a tour of their home soon. The view from their back garden. I probably should have changed clothes. Do you find your wardrobe sometimes match your décor? 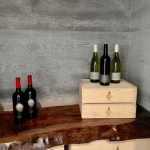 Previous Post: « Paris Budget Shopping–Is This Title a Downer? They say to look inside your closet to determine what colors you should incorporate in your home. Beautiful! That table is so pretty and springy! Love the shell napkin rings. 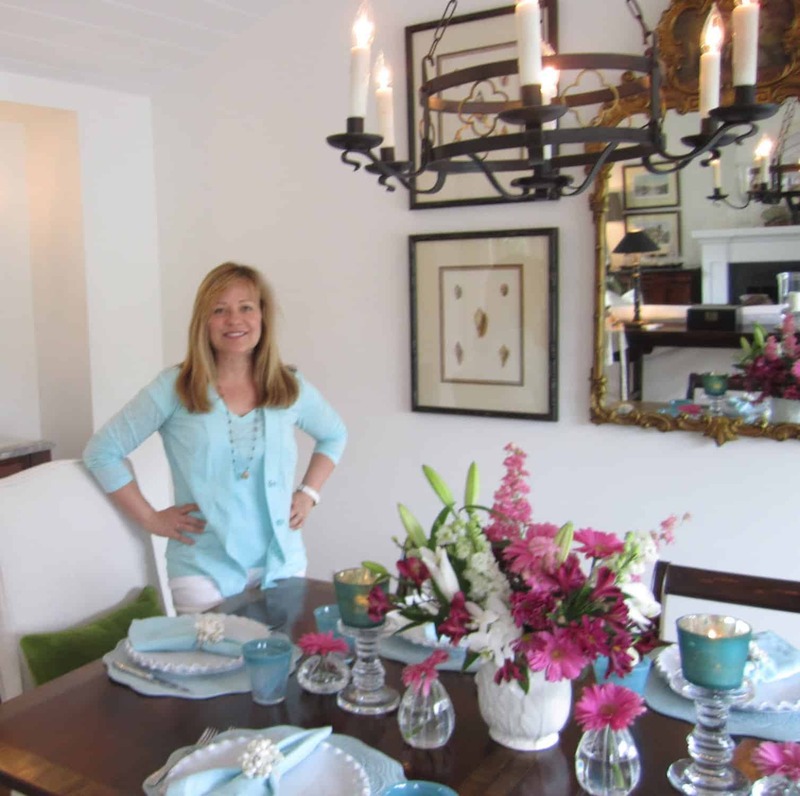 I DO match my decor – my house is a total reflection of colors I like to wear! So pretty! Love the colors you used for your table! My wardrobe tends to be very colorful as is my decor, so I either totally match or completely clash. I'm never the neutral that could blend into the background. Thanks for sharing. Too funny….you matched the table! I like that fact! BTW, the table was beautiful! Now that you mention it…I do wear alot of black and white combos….maybe that is why I painted the kitchen black and white!!! Haha, funny. Fashion is a great source of inspiration for interiors. I guess you proved the point well. Can't wait to see your mom and sister's home tour. Love all the coordination especially your outfit with the beautiful table setting – too funny!! Clearly the subconscious of your mind's eye at work!! 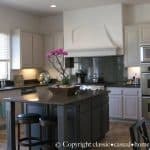 I'm looking forward to the home tour…I'd love to see how you mixed the two styles! I wore light blue on Easter, too! Now that I think of it, I used china that has the same shade in it!! Gorgeous table setting! I think they say we all wear the colors in our decor. Isn't there a show on HGTV about that? You look lovely in blue btw. It is so true that we decorate our homes in the same colors as out wardrobe. So funny. Love your sister's home. 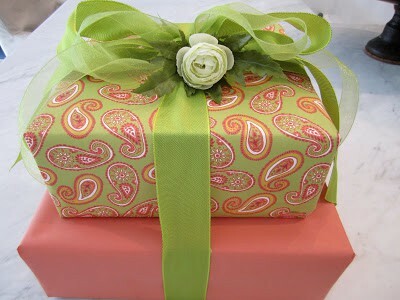 You gist was beautifully wrapped, and you outfit is perfect with the table. Can't wait to see the entire home. I think it is so funny that you matched the table! I always seem to dress my kids in colors that coordinate with my outfits when we go out somewhere. My husband swears I do it on purpose but I don't – I must do it subconciously. Oh I am a huge fan of coordination. To me it shows that thought and effort has been given…beyond the norm. Thank you for leaving a comment last week. We had a great time in CA. Miss it already and the weather. Beautiful table setting! 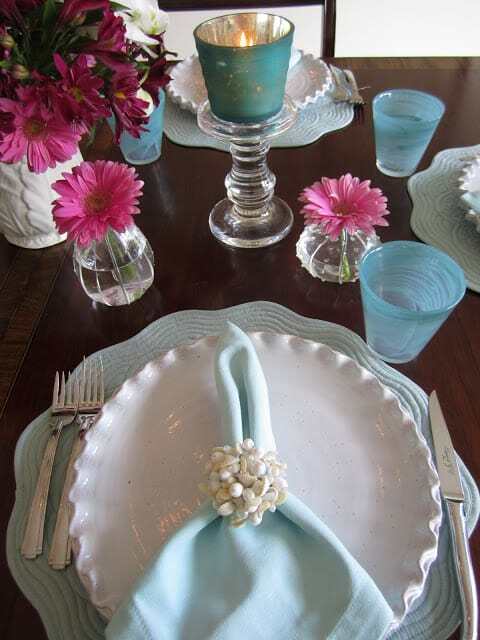 Love the blue glasses and the napkin rings. It all looks so pretty. Your table looks beautiful. I rarely match anything because I'm usually in my painting or gardening clothes! That is a truly scrumptious table! And I love that you coordinated with it. 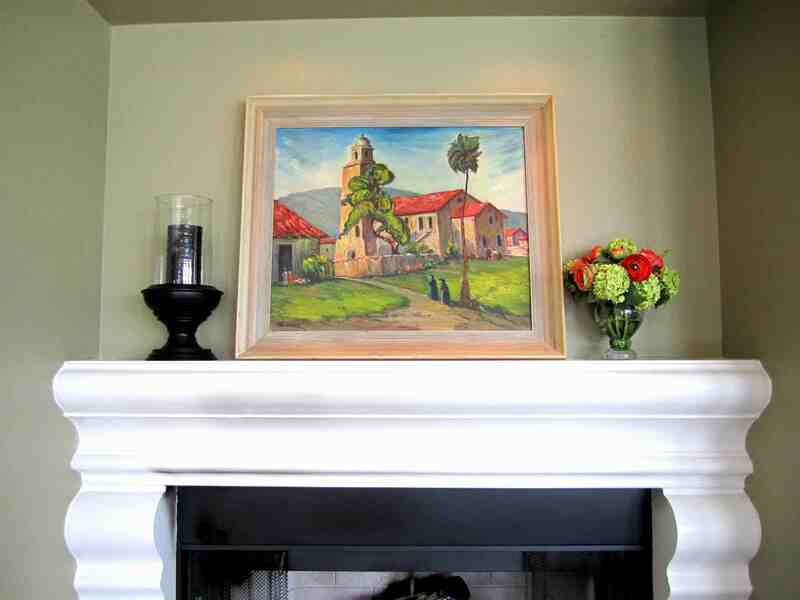 Have you noticed that often designers on TV "match" their home reveals?!?! This is really interesting to me. Both of my sisters' homes reflect the type of clothing they like to wear. thanks for coming by today hon, and for your sweet comments. 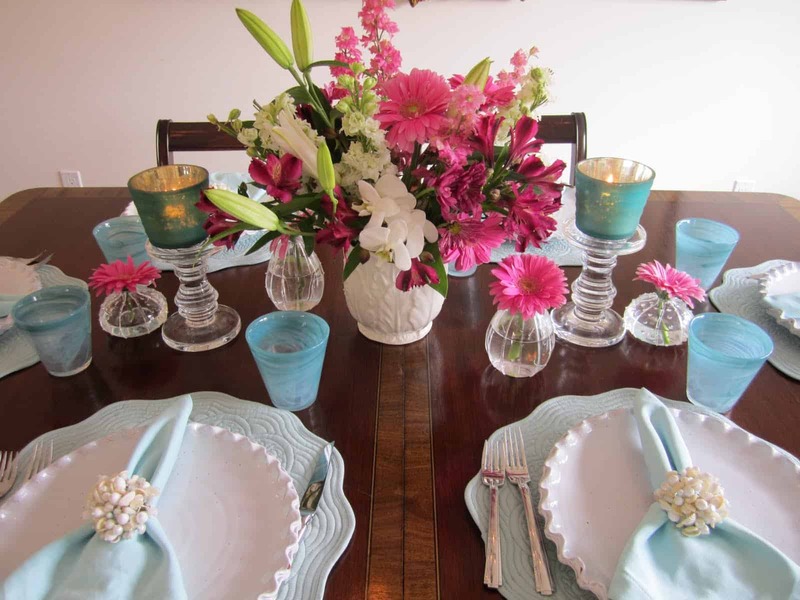 Love your table, that is my all time fav color of blue, and it looks wonderful coupled with the hot pink. Very pretty table, and you look great in the same colors, sometimes I actually try to match the table, not always. Beautiful table setting and you look great in blue! Would love to tour their home!! That's so funny!!! I think you were definitely inspired by what you were creating. Or vice versa. That table is just lovely!!! I do end up matching my decor – but isn't that a good sign? It's best to surround yourself with the colors that make you happy. And those should be the ones you're dressing yourself in, too! I love your sis and mom's home!…it is gorgeous and your matching present, gee! Your outfit does match your table too, hahaha…but you look so pretty as part of that beautiful table setting…I'm crazy about your plates, their just beautiful! Thank you for coming by and for the lovely comments, I'll for sure will be visiting you again! Hi Mary Ann, What a beautiful table and I love the soothing blue color. The white plates are also wonderful. Thank you so much for joining my party. GORGEOUS table setting. 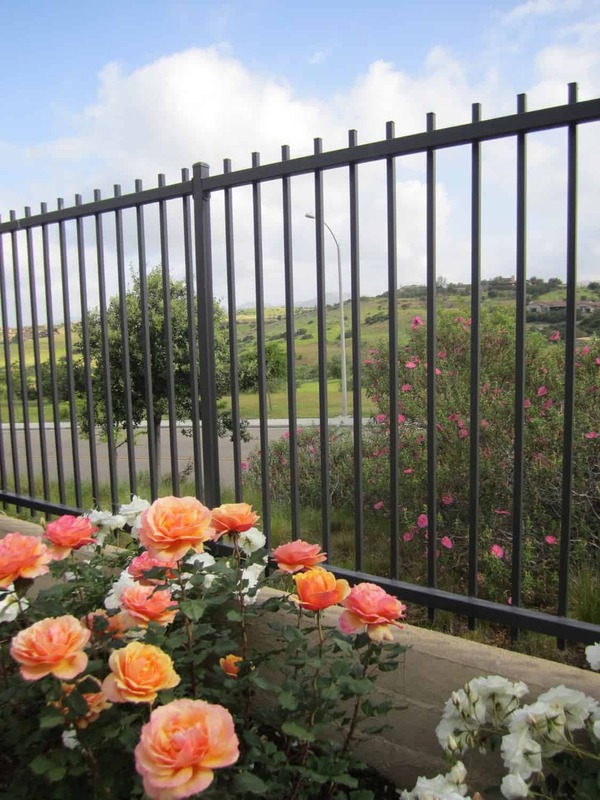 I also loved the rose bushes in the picture of your sister's backyard. I want that salmon colored one! You are so darn talented – that table is gorgeous!! The present is gorgeous – as are the "sneak peeks" of your sister and mom's new home!!! I love how the blue and pink yell "Spring! ".Makes the table pop. Many times I have worked on a project and I must subconsciously be stuck on that palate. I have not only accidentally dressed myself like that, but my kids as well! One track minds sometimes… Gorgeous table. 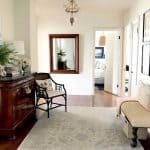 I'd love to see how you answered the challenge of mixing two styles in one home. That's such a lovely table setting! *** I sooo appreciate and prefer UNDERstated elegance, as you have done/shown here… it's just soooo clean, lovely and "WELCOMINGLY CHARMING" (and IMHO, THAT'S the ultimate compliment!). I must admit to having a bit of ENVY at your ability to think about coordinating your clothes WITH your table… I plan and plan and everything can truly look fab. Then I finally start to think "OMG, what shall *I* wear? "… Yer gooood, girlfriend!!! 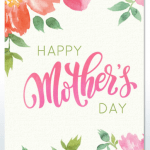 Warmest wishes and happy upcoming Mothers' Day! Beautiful, serene table…love the pale aquas. Beautiful home and great pics. Love the colours! Thanks so much for stopping by Beach Cottage Good Life Wednesdays! I have added you to my side bar. I really think your blog is interesting and beautifully edited. Beautiful tablescape – such a soft, pretty color. I love how your gift wrapping matched your sister's decor – I do find that I match my decor with my clothing quite often…glad I'm not alone. The table setting is gorgeous!! Have a lovely weekend. All the colors are just beautiful! The wrapping on the gifts is perfect isn't it? And, your attire is indicative of your favorite colors I think. At least that holds true for me. I use the same colors in decorating that I like to wear. The table is just gorgeous ~ such a peaceful feeling. Wow!! Everything is just beautiful! I love the back yard view..breathtaking! And I absolutely LOVE the pink and blues combined on the table. I have never really liked that combination until I saw how you paired it together. You made it seem so effortless! Beautiful! I'm about to have the same decorating problem here. My mother in law in moving in. She is all lace and ruffles and traditional and we are more modern. She's already telling me all the things she's taking of my house and what she'll be adding of hers….oh lord! Wish me luck! You should have sprawled yourself accross the table! You would have looked gorgeous on there! heehee! LOVE the colors. yes! I agree, I love to wear pink clothes and I am bringing more and more pink in my home! Mary Ann, soo pretty! You did such a lovely job! 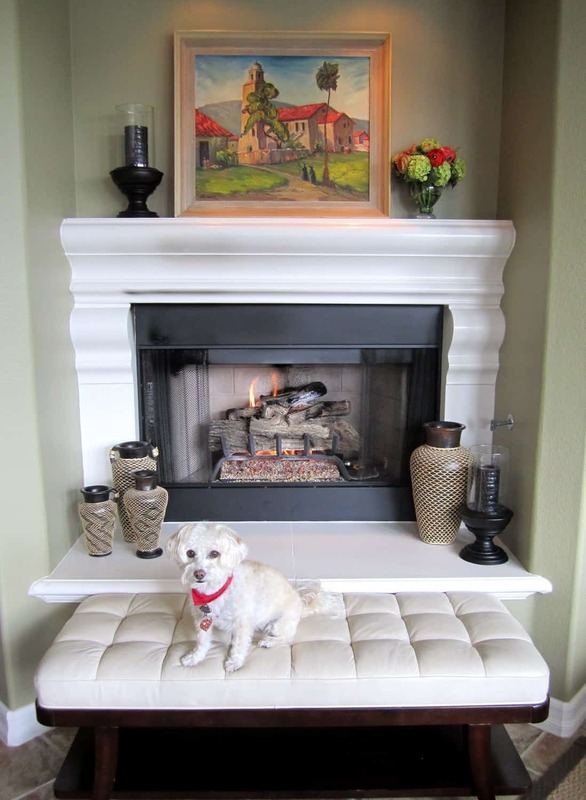 The table is stunning…and I think it is perfectly fine to blend in with your decor! Especially if the colors are blue and hot pink! What gorgeous colors. So beautiful. Glad you could be a part of Seasonal Sundays.